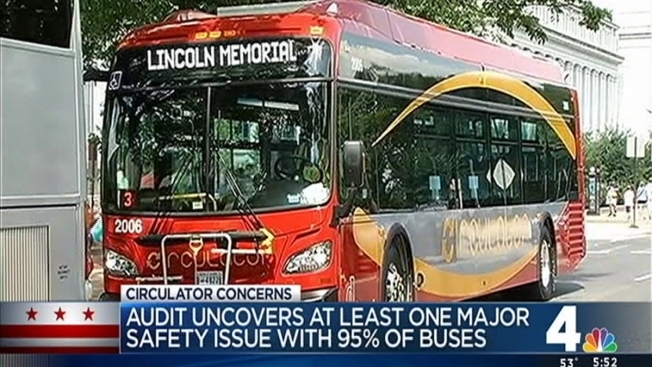 An audit has found that 95 percent of Circulator buses in D.C. had at least one significant safety problem. WTOP-FM reports that the Transit Resource Center's audit found that some of the problems were so significant that the buses should have been pulled from service. Some of the safety defects included issues with equipment, engine compartments, driver controls, cracked windshields in drivers' views, fuel leaks and exposed wires. The audit also determined that the D.C. Department of Transportation failed to effectively oversee First Transit, the private contractor that operates the buses, WTOP-FM reports. The department says it is actively monitoring the buses' performance with the help of the Washington Metropolitan Area Transit Authority. Washington's Council Transportation Committee is expected to raise the issue at a hearing Friday.